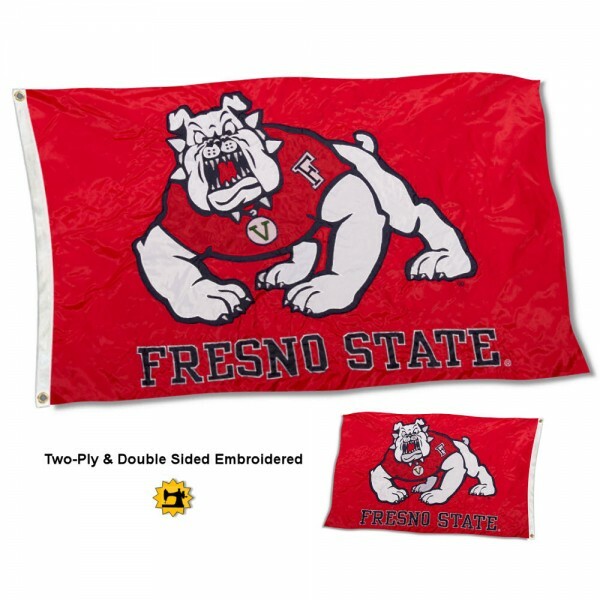 Our Fresno State University Flag - Stadium measures 3'x5', is constructed of 2-ply 100% nylon, has quadruple-stitched fly ends, has embroidered NCAA insignias, and metal grommets. Since our Fresno State University Flag - Stadium is 2-ply constructed, the NCAA logos are viewable and readable correctly on both sides. Our Fresno State University Flag - Stadium is the official flag flown over the College Football Hall of Fame and from stadiums and arenas across the country. Fly your Fresno State University Flag - Stadium with our tailgate flagpole or 6' aluminum flagpole and adjustable flag bracket.